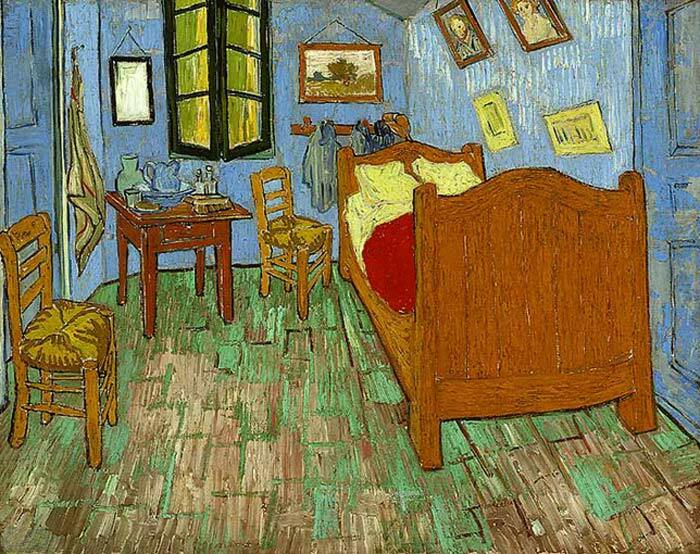 Here, Van Gogh has depicted his bedroom in the Yellow House, furnished with simple pine furniture and his own paintings. Over the bed hang Van Gogh's portraits of the poet Eugène Boch and the soldier Paul-Eugène Milliet. The most striking aspects of " Bedroom" are the bright patches of contrasting color, the thickly applied paint and the odd perspective. The rear wall appears strangely angled. This is not a mistake: this corner of the Yellow House was, in fact, slightly skewed. SPECIAL NOTE : The painter will make the reproduction as close to the original oil painting as possible. If you want your painting to alter from this likeness, please email us and " The Bedroom, 1889 " will be reproduced according to your special requirements.